Just learned about this tool from Lifehacker. Haven't tried it, so I can't comment on its worthyness, but if you need to move your notes from Evernote to OneNote, this might be helpful. Each Evernote notebook will be imported into OneNote 2013 as a separate OneNote notebook file, and Evernote stacks aren't supported. So you may want to do some consolidation of notes afterwards, but overall it works quite well. There is a minor bug whereby the program does not report that it has completed importing, but rest assured, it's working. Note the migration tool works ONLY on Windows. I just tried it. It is blazingly fast. It's so fast, I wondered if it actually worked. But when I went to OneNote - there they were. And I was able to resize the images to my heart's content. What an amazing difference in speed when compared to the let-me-brew-a-pot-of-coffee-while-I-wait for the Evernote to Evernote transfer to finish using the .enex export. doesn't work for me at all, no progress after "parsing notes from Evernote" appears. 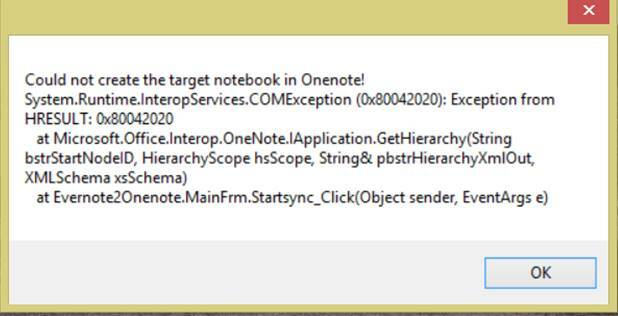 Sorry, since I haven't used the Evernote2Onenote tool yet, I can't be of much help. JBenson2 (above) found that it worked fine. Since this is a 3rd party OneNote tool, I'd suggest checking the developer's SourceForge.net site, and doing a Google on "Evernote2OneNote". It looks like this tool is under active development, so of course you want to make sure you're running the latest version. I had to go back to an older version to get it to work. 1.0.6 did not work, but 1.0.5 worked fine. Give it a try. I found that version 1.0.4.147 worked just fine. Neither 1.0.6 nor 1.0.5 would work on my Windows 7. Many thanks for a great Evernote to OneNote migration tool! I successfully migrated one notebook from EverNote to OneNote. Then the next one failed and I got the error message below. And now I can't migrate anything at all. Can anyone tell me what happened? And how I can fix it so I can migrate all my data to OneNote? As I said above, this is NOT an Evernote product. See below. Also, did you see the posts by other users who had to use earlier version of the tool? Verify that you have at least .Net Framework 4 installed, anything older will not work. I just downloaded Evernote2OneNote from SourceForge. This app is Excellent. Export in EN to .Enex and then Import your .enex file. Really easy and so far it looks like I won't have to do any kind of clean up in OneNote. Could you please provide a link to the tool you used? This tool does NOT require you to first export EN to ENEX, so that makes me wonder if it is the same tool. IAC, this tool has a very serious caveat: If you have more than one Tag assigned to a Note, the Note will be imported into ON multiple times. Notes are imported to Onenote in a tab that has the same name as the tag the note has. If a note has multiple tags, that note is imported multiple times to Onenote, so you get duplicate notes! To avoid duplicate notes, you should first remove duplicate tags from your notes in Evernote. The easiest way to do that is to create an empty new notebook, export your real notebook in enex format and uncheck tags from the export options. Then import that enex file into the new notebook. And then of course only import that new notebook into Onenote. "File contains a Trojan Virus. It has been Quarantined" - Risks: Trojan (HEUR/QVM03.0.Malware.Gen). Is the source/ file reliable ? Then I can treat this as a false alarm and accept the file for my work. Personally, I would not trust anything from Sourceforge anymore. I did the import - not to move to OneNote but as a backup - You never know what is around the corner - Anyway the import took 3 hours - I've no idea what it did for 3 hours because I can't find any notes that have been imported - It claimed it was a success!! I did find about half of the notes that were imported into OneNote which was useless as any kind of backup. I tried it, but the fact one cant search inside of pdfs, and lack of tags means its not a great solution for me. Also I didnt see a way to double click or open an expanded pdf in an external editor..